One of the fun things about being gluten-free is when you get to sulk publicly at other people when they eat things you're not allowed, like pies and pasta - even if you're actually rather happy that your colourful bean salad looks much nicer than their petrol garage sandwich. 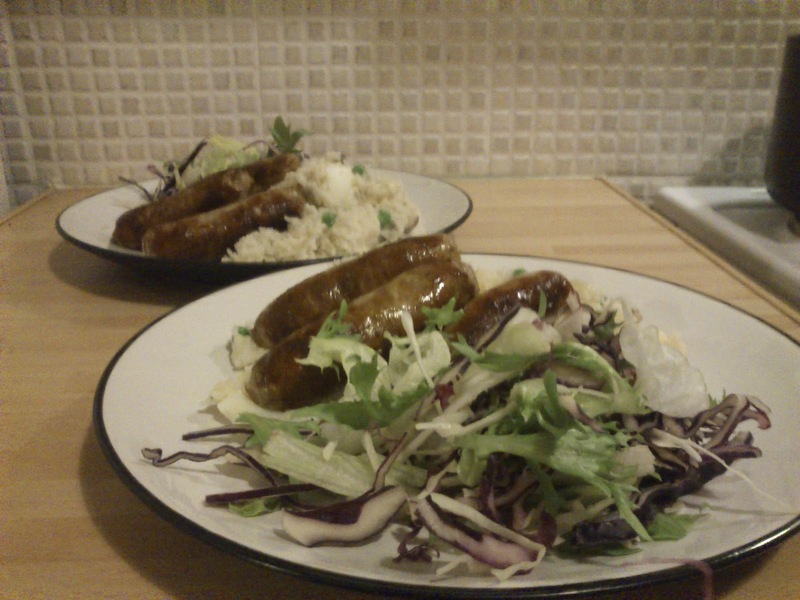 However, one of the things I REALLY missed when I found out I was gluten-intolerant about 10 years ago was sausages. Now, I love sausages. I mean, I really really love sausages. (Yes, you can all stop giggling now and thank your lucky stars Brussels hasn't made us call them 'cow innards stuffed with minced bits of pig and preservatives'.) The thing is, up until a few years back, you couldn't get sausages without the added extra rusk they put in to bulk them up. However, if you go into Sainsburys now you'll find at least three different gluten-free sausage options, all of varying quality and taste, and this for me is a serious answer to prayer. One of the first companies that burst onto the scene a couple of years back was Debbie & Andrews, and I have to admit that I think they still make the best gluten-free sausage (their Harrogate brand) that is widely available. It's one of the only gluten-free alternative foods that I will buy for both me and the other half, as they are just as nice (if not better) than your fairly high-quality 'normal' supermarket version. Cook enough rice for two (or four, if you're taking to work tomorrow too) and hard-boil four eggs. In the meantime finely chop 2 shallots and fry slowly in butter. Add half a chopped chili and some diced mushrooms, cook for a couple of minutes and then add frozen peas. Heat through slowly until the peas are warm and add the cooked rice. You might want to add a bit more butter if you're being naughty (never trust a thin chef, that's what I say), and then heat all through until the rice is coated with shallots and buttery goodness and the peas are cooked through. Chop the eggs into quarters and add to the mix with chopped parsley and loads of salt and pepper, and serve. George rolled his eyes when I suggested the amount of salad on the plate made up for frying the sausages and coating the rice in butter. Never trust a thin chef reminds me of that fridge magnet I used to have, saying, Never trust a doctor whose office plant is dead. I love sausages too. That's brilliant. What's even funnier is you should see the amount of dead plants in the office where I work...!! !